Instant Pot Lasagna has become the most exciting thing to happen to my kitchen! Especially since I don’t have to worry about a ton of different ingredients that would make my kitchen messy. I love creating easy and delicious meals in my instant pot, especially pasta dishes. I knew that I had to attempt to make an instant pot lasagna recipe as soon as I could one day. That one day was today, and it did not let me down at all. 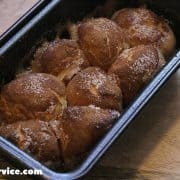 I’ve seen several ideas of people doing this recipe in a slow cooker, but I haven’t seen anyone do it in their instant pot. The recipe normally calls for lasagna noodles, but I decided to do it with a 3 cheese ricotta filled raviolis! I used fresh raviolis in this recipe. You can use frozen ones, but you will have to adjust the time allotment by 5 extra minutes. Instant Pot Lasagna: Kid Tested and Approved! This recipe is also kid tested in my home! All 4, including Angela into that, gave me the huge thumbs up! I’m going to love using my Instant Pot during the hot summer months when I don’t want to turn on that dreaded oven. So that’s a winning thought for me already. I’ve already made a yummy monkey bread, a strawberry cobbler, chicken parmigiana, and so many other recipes in my Instant Pot so far. I can’t wait to keep on making more! It turned out so super cheesy and full of great flavor. Now the question, “Why did you just use lasagna sheets?” Well, IMO they are so thin and would just disintegrate and turn into mush. At least the raviolis have a much firmer texture and are locked into place, so I didn’t fear that they would be mushy or fall apart. Just a little too much extra work, and I need to make fast and easy meals for my big family. I cooked this in a PIP method with a 1.75 Quart Pyrex glass bowl dish. It’s just deep enough for my IP and still be able to feed my family. Here’s the recipe, and I hope you enjoy it! Place 4 tablespoons of sauce at the bottom of your container you're cooking in. Add a layer of mozzarella cheese, followed by a layer of sauce, and then a sprinkling of parmesan cheese. Repeat this method until all raviolis have been used, and you do a final layer of sauce on top with parmesan cheese sprinkled over. Place 2 cups of water in your IP container, and then place your dish in. I used ramekins because I wanted more height from the base of the IP. The ramekins area approximately 1 1/4" tall. Place lid on your IP, and lock into place. Put on 12 Minutes High Manual Pressure. When time is completely, do a QR. Remove lid and add final layer of mozzarella cheese on top, and sprinkle oregano on top of the cheese. Place lid on the IP to help the steam melt the cheese on top. No need to lock the lid in place. That’s how super easy it is to make! I hope you enjoyed my recipe! Don’t forget to Pin this for later for you to come back to and make! You’re family will crave you to make this instant pot lasagna over and over again. So glad I stumbled across your blog. 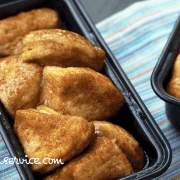 I have pinned several of your recipes to try this week in my instant pot. Thanks! Awww! Welcome to my life! 😀 So glad you stumbled across me! Can you use frozen ravioli? Should you thaw or just increase cook time? You totally can! I would recommend adding an additional 10 minute cooking time on to it. Enjoy! I am new to this IP thing – you place a container of water on the heat source and under the pan insert? Hi Tammy! It means to put water in your liner, then place down your trivet or ramekins, and then place your pan full of ingredients inside of your liner. Hope this helps! Did you use a 6 qt. IP or an 8 qt? I did not think a 7 cup glass bowl would fit in my 6 qt.! 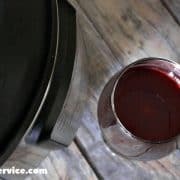 I came across your recipes when my daughter tagged me in your Instant Pot wine recipe. I love your recipes and so enjoy reading about your family. Thank you! Awwww. Thank you Mary Jane! I totally love having you here! I have a 6 qt ip, what size boil do I need? Something taller than wide? Will that work? Do you need to cover with tinfoil? No need to cover with tinfoil. 🙂 You can if you want to, just spray the top of the foil with a little bit of non-stick spray so the cheese doesn’t stick to it.